Beyond the orbit of Pluto lies a small world known as Haumea. Named after Hawaiian goddess of fertility, it is one of the five dwarf planets in our solar system. It is about half the size of Pluto, but it shares something in common with the gas planet Saturn: an icy ring. An image of Haumea with its two moons Hi’iaka and Naumaka. Credit: CalTech, Mike Brown et al. 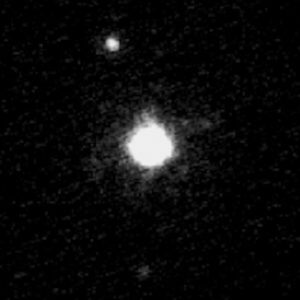 Haumea is difficult to study because of it’s small size and great distance. From initial observations we couldn’t even pin down its size with accuracy. This is because Haumea spins very quickly on its axis. A day on the small world would only be 4 hours long. Because of its rapid rotation, the world is flattened into a somewhat egg-like shape known as an ellipsoid. But in January of this year, Haumea passed in front of a dim star as seen from Earth, which allowed astronomers to use the occultation of the star to determine the size and shape of Haumea more precisely. A team of nine observatories observed light from the star as the dwarf planet passed in front of it. Since each observatory viewed the star from a different point of view, they saw different parts of the planet block the star. This allowed the team to confirm Haumea’s spheroidal shape. But the team also found that the star briefly dipped in brightness a bit before and a bit after Haumea crossed its path. This is consistent with a ring around the small world. Based upon observations, the ring has a radius of about 2,300 kilometers, and is about 70 kilometers wide. 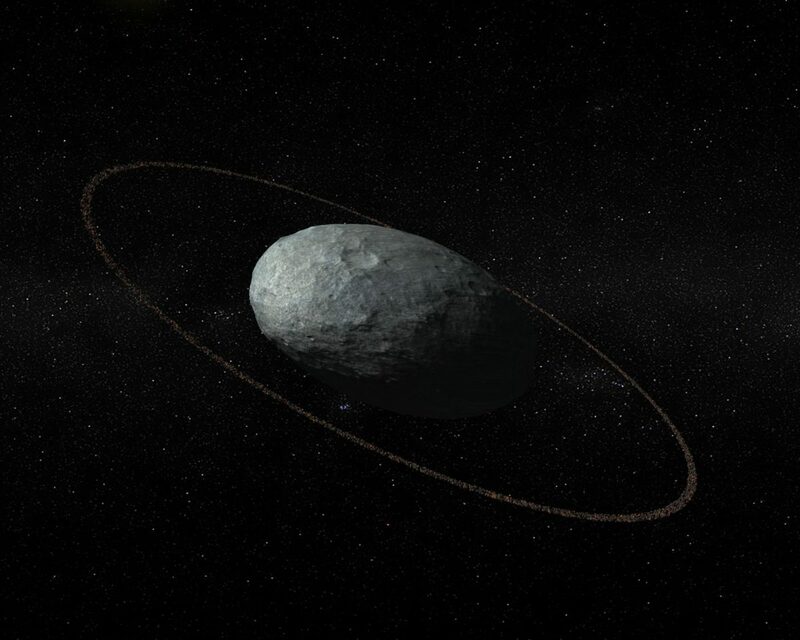 It’s not nearly as grand as Saturn’s rings, but it makes Haumea only the second small world known to have a ring system. speaking of odd objects. Here is breaking news of one that is apparently a visitor from outside of the solar system.